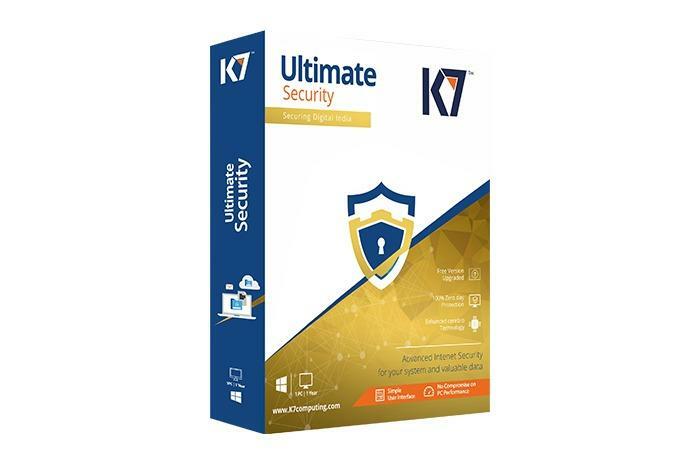 K7 Ultimate Security is capable, and has a lot of the features you need in a deluxe suite without overwhelming the user. Security is an essential element of any PC user experience—even if you don’t use a third-party security suite. But it’s so easy for these suites to become overcomplicated and loaded with tools nobody really needs. That’s why it’s refreshing to see K7 Ultimate Security for Windows from UK-based K7 Computing. This is an at-once simplified yet effective security suite, although its pricing leaves a lot to be desired. The default view in K7 Ulimate Security. 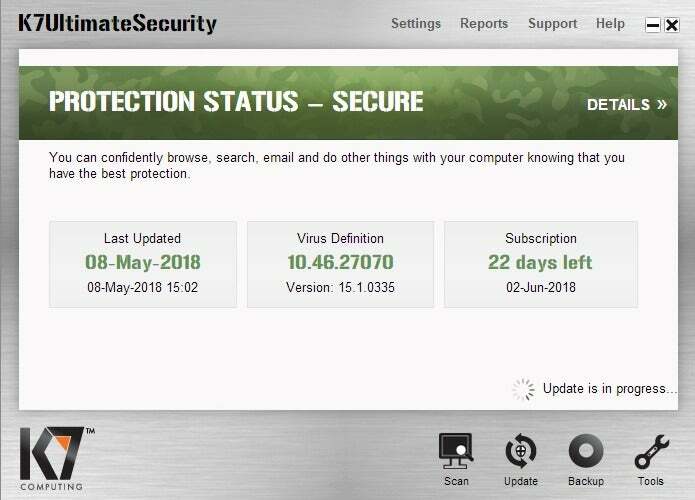 When you first open K7 Ultimate Security it displays a very basic dashboard with a protection status banner at the top and then three non-clickable status tiles: Last Updated, Virus Definition, and the number of days left in your subscription. If everything is all right, the banner and the tiles are green. If there’s a problem then it’s red. It’s really nice to see such a simple interface, though the Last Updated tile could be swapped out for more relevant information. Do you really need an entire tile dedicated to telling you when the virus definitions were last updated? I don’t think so. In fact, this is supplementary information that would fit under the Virus Definition tile. Instead of Last Updated it would be nicer to see something like Last Scanned so you can see when your PC had its latest full scan. Speaking of which, down in the lower-right corner are the key icons for taking action inside Ultimate Security: Scan, Update, Backup, and Tools. It’s a little odd that these options are shunted to the lower-right corner instead of putting them front and center on the dashboard. It appears K7’s approach is to involve the user as little as possible in security operations. All you need to know is whether your PC is secure and if the app is up-to-date. Any other headaches are for K7 to deal with. That’s a nice approach, but it does have its downsides. During my time with K7, for example, I made the switch back to Backblaze after an ill-advised adventure with CrashPlan right when that company was giving up on home users. When I tried to install Backblaze it would fail. I immediately suspected K7 was blocking the app even though Ultimate Security never alerted me to what it was doing. I turned to the internet to try and solve this problem. The fix I found got me closer to the goal but ultimately didn’t work. Rather than deal with the headache, I just turned off K7, installed Backblaze, and got on with life. That’s not the ideal situation, but I simply can’t abide security suites that get in my way and try to stop me from doing something. Especially when that suite doesn’t alert me to what’s going on and that it’s blocking the program. I suspect most people would come up with the same solution that I did. K7 Ultimate Security’s scan options. Returning to that lower corner, clicking on Scan calls up the app’s various scanning options. These include the usual options such as an entire PC scan, a quick scan, or a custom scan. 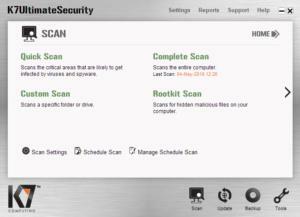 K7 Ultimate Security also has a rootkit scanning option. 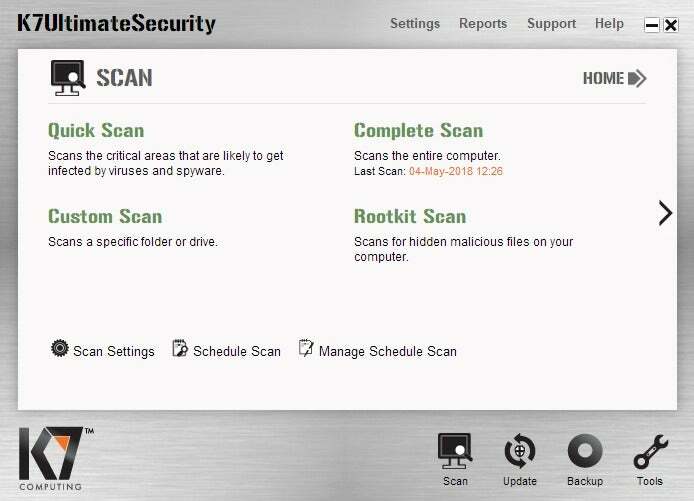 Although it’s not listed here, K7 Ultimate Security offers to scan USB drives when you plug them in. K7’s Backup option lets you configure your backups to a local drive. The interface is easy enough to use, though it would be nice to see an encryption option for those who want it. 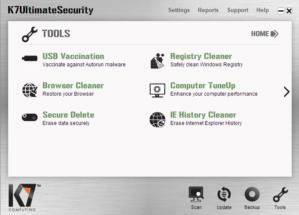 The Tools section in K7 Ultimate Security. 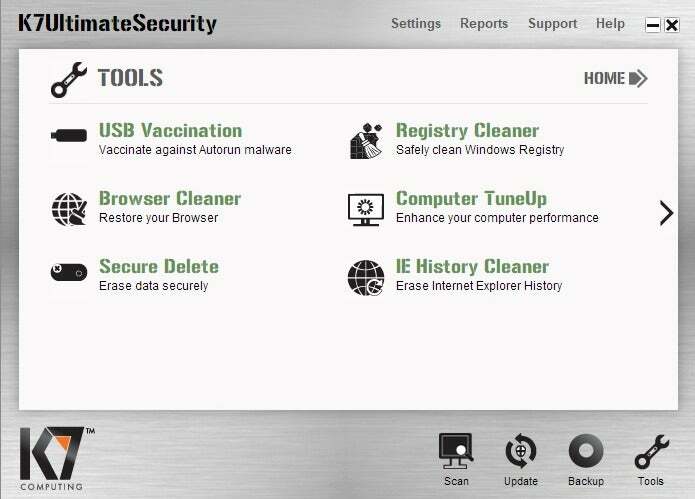 Finally, Tools offers the usual “extras” you see in deluxe suites like these including a browser cleaner, registry cleaner, a generic PC tuneup option, and USB vaccination to prevent autorun malware from ruining your thumb drives. That’s pretty much the bulk of K7’s security suite. At the top right of the application window there is also a settings option, as well as a reports section for seeing what’s been quarantined, viewing system monitor events, and security event history. There are also help and customer support links. 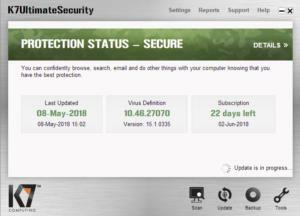 AV-Test gave K7 Total Security, the lower-tier security suite with less extras than Ultimate Security, a 100 percent score in June in its zero-day and web-attacks test with 225 samples. For the larger “widespread and prevalent malware” test K7 got 99.8 percent against more than 5,500 samples. The suite had no false warnings or blockages, but it did have 11 false detections of legitimate software as malware during a system scan. In AV-Comparatives’ real-world protection test against 186 samples for July 2018, K7 scored around 98.9 percent with seven false positives. In the malware protection test K7 had a 97.7 percent offline detection rate, a 98.2 percent online detection rate, and a 99.81 percent online protection rate. This last test pits antivirus suites against more than 20,000 malware samples. 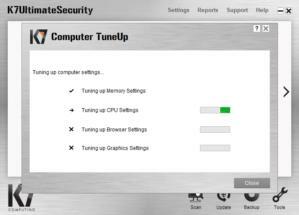 Tools > Tuneup in K7 Ultimate Security. For our in-house performance test, K7 improved the performance of our test PC, which has been something of a common theme in recent months. However, the improvement was not as dramatic as we’ve seen with other suites. Before K7 was installed, the PC scored 2,382 in the PCMark 8 work conventional test. After a full disk scan with K7, the score went up to 2,432, an improvement of 50 points. For this test, the bigger the score the better. As for the Handbrake test, there was no change between pre- and post-scores. Without antivirus installed, the PC encodes a 3.8GB MKV 1080p video file to the Android tablet preset in one hour and 15 minutes. After K7 was installed that number went down slightly to one hour, 14 minutes, and 49 seconds. K7 is a capable antivirus suite with some questionable design choices, but a simplicity that shouldn’t be overlooked for everyday users. The bigger drawback, however, is the price. For first-time users, K7 only charges $40 for the suite for a single PC. The typical price, however, is $75, which is a crazy price for a single PC when you can get 10 devices for $100 with suites like McAfee, Norton, and others. Still, if simplicity with a capable malware engine, and a good amount of extras appeals to you—and you really only care about protecting one computer—then K7 Ultimate Security is worth a look.